Reading virginity means recognizing that biology, anatomy, physiology, medical procedures, and medical jurisprudence have an indubitable role to play in Western thought, disciplines, and practices. But how does it end? How does “not knowing the sexual act,” “not having the status,” “not being,” really come to an end? Professor Mihelakis is author of La Virginité en question, ou les jeunes filles sans âge (Les Presses de l’Université de Montréal, 2017). 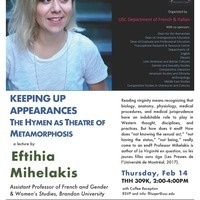 This event is part of the Lecture Series Intersexions of Gender, Spring 2019.